Corbon DPX is a premium brand of self defense ammunition sold by Dakota, the same company that also makes ammunition under the Glasser name. The “DPX” stands for Deep Penetrating X bullet, and it is available in a variety of calibers. 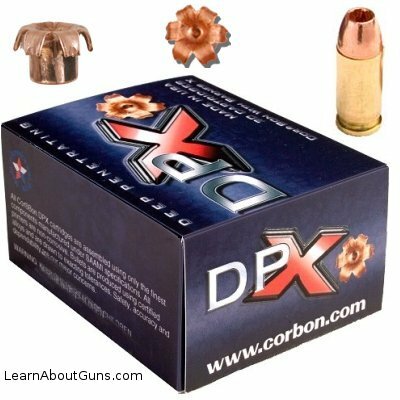 What sets the Corbon DPX apart from most other self defense rounds is that it contains no lead. Instead, Corbon DPX makes use of Barnes homogeneous coppers hollow point bullets. Looking at the Corbon DPX, the first thing one notices is the massive hollow cavity at the front of the bullet. I’m accustomed to the appearance of hollow point ammunition, but was amazed when I first held a round of Corbon DPX. This larger than normal hollow area is likely due to the fact that this bullet is made of copper, which is a harder metal lead, meaning that less metal is needed or desired in the part of the bullet that is to expand upon impact. Because its bullets are made out of single pieces of copper, Corbon DPX doesn’t suffer from fragmentation problems that copper jacketed lead bullets can experience. Fragmentation can be a problem because a bullet that breaks up into small pieces will generally not penetrate as deeply as a bullet which maintains its structural integrity. Penetration depth, in turn, matters because the only reliably way to stop an attacking criminal is to have the bullet penetrate deeply enough to reach and disrupt that criminal’s vital organs. Thus, a bullet that maintains its integrity as it penetrates will tend to be a more reliable bullet when it comes to stopping a violent attacker. Another benefit of being made out of a single piece of copper is that the Corbon DPX exhibits reliable expansion, regardless of whether it first passes through an intermediate material such as heavy clothing. Looking at the data generated by Dr. Gary Roberts, the 140 grain .40 S&W Corbon DXP bullets expanded to exactly 0.64″ whether fired into ballistic gel covered with 4 layers of denim or bare ballistic gel. To compare, a 180 grain Federal HST JHP expanded to 0.56″ when fired into ballistic gel covered with 4 layers of denim, and .70″ inches when fired into bare ballistic gel. Given that most criminals tend to be clothed, especially in the winter, it seems wise to have a hollow point round that will fully expand when used against such a clothed criminal. I thankfully have never had to fire a gun a self defense, and hope that I never do. Thus, I cannot give any first hand accounts about the effectiveness of the Corbon DPX. However, I can say that a rather persuasive survey of self defense ammunition lists the Corbon DXP as a recommended choice for .40 S&W and other calibers. I can also say that an acquaintance once used a round of Corbon DPX to quickly and effectively defend himself against a large attacking dog. I’ve found the Corbon DPX to be more accurate than the cheap full metal jacket ammo that I use for target practice, which isn’t surprising. It seems to be just about as accurate as any other hollow point ammunition I’ve fired. That shouldn’t be too surprising either, since most gun owners (myself included) tend to be more limited by their own skill than by the accuracy of any halfway decent ammunition. I haven’t experienced a failure to feed or failure to fire with DPX (or any other Corbon ammo for that matter). So far, I’ve used it in my Springfield XD pistols, my Ruger PC4 pistol caliber carbine, and my Smith and Wesson Model 610 revolver, all of which are chambered for .40 S&W and did quite well with the 140 grain Corbon DPX. Corbon DPX is the most expensive pistol ammo I’ve ever used. Prices seem to fluctuate based upon supply and demand, but I would say an average price in 2009 was around $35 for a box of 20 rounds. That is nearly twice the cost of some less expensive lead-based hollow point bullets, and many times the cost of cheap full metal jacket ammo. However, I can’t say that the cost bothers me much. I use this ammo for self defense purposes, keeping my pistols and pistol caliber carbines loaded with it. Aside from firing a box through each gun to ensure reliable feeding, and disposing of ammo that I’ve had in my concealed carry pistol for more than a few months, I don’t fire these rounds often. So, the cost is rather low, and the peace of mind I get from knowing I have an excellent self defense round is priceless. ALSO READ: Urge Your Senator to Support Concealed Carry Reciprocity - Today! The Corbon DPX is a copper hollow point bullet that reliably expands and penetrates deeply. It is a bit pricey, and can be hard to find at times. However it is my favorite self defense round for handguns, and I highly recommend considering it. Thanks for the review of Corbon DPX; do you have an opinion on Corbon Powerball ammo for self-defense? I dont’ have much of an opinion about Corbon powerball, other than to say that I remember seeking a test where some of the lighter weight ones would fragment, rather than penetrating deeply enough. I’m a fan of Corbon in general, and used their standard hollow points before switching to the DPX. Thanks for the Corbon bullet review & data. I am still carrying Hornady xtp in all my wheel guns & Hornady personel defense ammunition in my autos. I am going to have to try some Corbon. It is a good point you made about not having to pickup brass from a revolver. Why I love revolvers. Power is essential in the armored business, which is reason for Corbon .45 ACP +P 230 grain 950/461, JHP SKU: SD45230 to be the primary cartridge in my duty weapon. For off-duty, home, and personal protection applications, I am a heavy bullet advocate and favor the Buffalo Bore .380 ACP +P 95 grain 1125/267 JHP SKU: 27D/20. I own/shoot and use for personal protection, a Ruger GP100 357, and a Ruger LCR Ultra Light 38. Both are loaded and fired using CORBON DPX . I would like to know which grain You would recommend for maximum penetration and effect in the event of the necessity to use for maximum power/penetration/and damage. I am currently using 110 gr DPX SPECIAL+P in the 38 and 150 gr in the 357 but no longer have the box to know exactly other than knowing it is the last of the 357 CORBON DPX I have left for the 357 and I am getting ready to purchase aditional ammo (CORBON DPX) in 357 as well as additional 38 DPX. Appreciate You're answer/response on this matter.